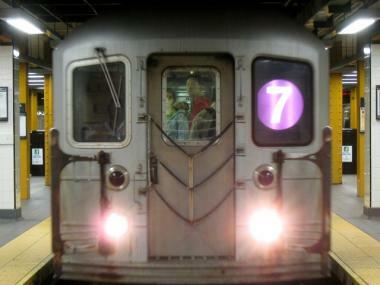 7 train at Main Street in Queens, photographed in 2008. QUEENS— Straphangers at Court Square will be in seventh heaven once again on Monday when the 7 train resumes service at the Long Island City hub after 11 weeks of halted service, MTA officials announced. The 7 line’s Court Square station platform was closed Jan. 21, 2012 for a series of repairs and improvements including a relocated agent booth, new staircases and the construction of a new corrosion-resistant platform. "With full rehabilitation work nearly complete, the fast-growing area of Long Island City will have a refurbished and updated complex that will be fully accessible," NYC Transit President Thomas F. Prendergast said in a statement. The recent round of Court Square 7-line station improvements came on the heels of last June's opening of new escalators and elevators linking that 7 train platform to the G, E and M trains. The refurbishments to this transit hub come at the same time the area's residential population has been expanding. "Ridership [at Court Square] is definitely going up,” an MTA spokesman said, "and it has a lot to do with the new construction in Long Island City." Following a 2001 rezoning of 37 blocks of Long Island City — intended to stimulate commercial and residential development — more than 40 new developments have sprung up, according to Dan Miner, senior vice president of the Long Island City Partnership. "There is so much more residential and commercial properties than before," he said. "And if the MTA says our facilities need an upgrade, we take their word for it."